Rather than training only when a race is coming up, I have turned running into a lifestyle so that I can stay fit and ready. Without any event in mind, I habitually ran four to five miles two to three times a week and worked on strengthening my legs, especially injury-prone knees. I noticed my time rapidly, consistently, and drastically improving; several months ago, I was satisfied with running at a 9:30-per-mile pace, but now, even in extreme heat up to 105 degrees, I normally start out in the early 7:00-per-mile range and finish around 8:30-per-mile. 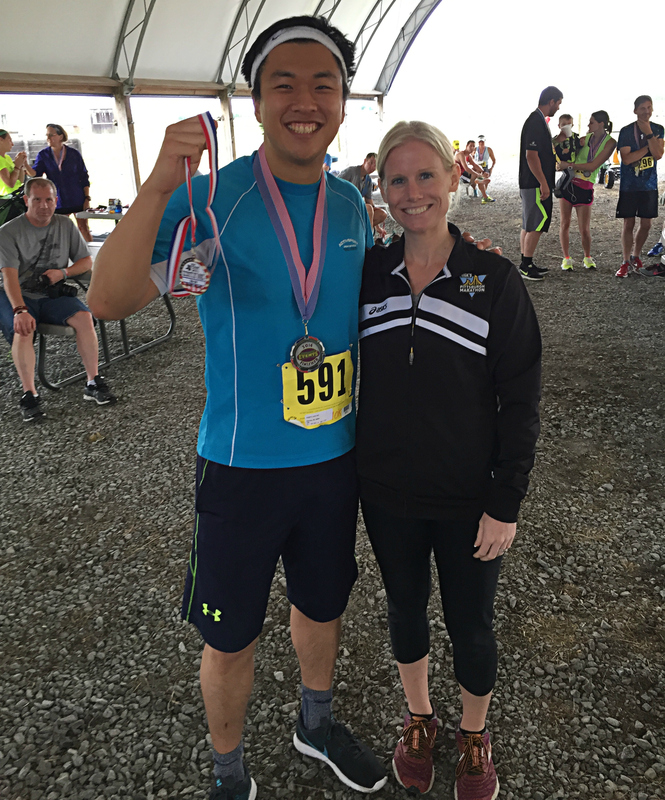 Scheduled to visit my best friend at Penn State University from July 27 to August 1, 2016, I suggested we run a half marathon near his house to recreate the memory of our first 13.1 miles together in Korea just over three years ago. 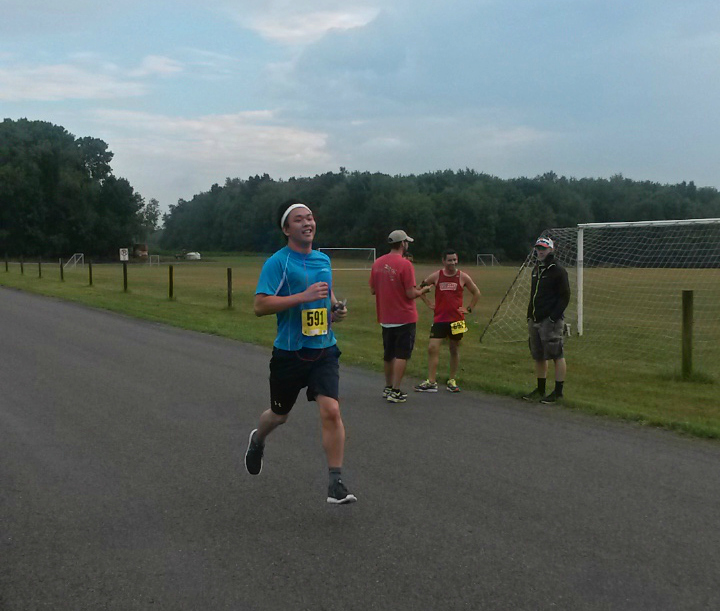 Nonetheless, due to his busy academic schedule, he told me he had jogged only twice in the past year, so I instead registered for the shorter Boot Scootin’ 10K for me and the Country Kicker 5K for him at the second annual Run Country Style in Mercer, Pennsylvania, on July 30. Set on participating in the Nebraska State Fair Marathon in Grand Island on August 27, I reasoned running a short race in advance would prepare me both mentally and physically for the former. Furthermore, with my constant speed progress in mind, I longed to test how fast I could run 6.2 miles specifically rather than relying on splits from longer races; as I am accustomed to conserving energy early on and covering far-longer distances, I wanted to pour every ounce of endurance I contained from start to finish in the 10K. I told the friend the day before the contest I would be content with sub-53:00 but, lacking details on the course, did not know what to expect. First place in my age group! The overwhelming rainstorm on our drive to the event location concerned me initially, but I trusted God would hold off this natural burden solely during the run and told the friend not to worry; as anticipated, the city rained significantly before and after but not during the race. Based on the results from the Run Country Style last year, I believed I had a shot at winning my age group of 25-29 but did not plan to turn the run into a bitter competition and add unnecessary pressure. I ran my own race at the pace I knew my body could manage and refused to be influenced by runners ahead of me to overpace and risk an injury. After all, my purpose of running has always been to challenge and compete with myself. At the beginning, fifteen runners or so stormed past me, to which I reacted in amusement, “Let’s see for how much longer they can keep up that pace”; many of them slowed down and even walked a few miles in, allowing me to pass. I was pleasantly surprised I could maintain my pace at a 7:00-per-mile range for the first several miles on a relatively hilly course. At times, I became distracted by adorable cows and donkeys and wanted to take pictures but could not throw away what seemed to be an inevitable personal record (PR) in the 10K. I gradually but barely slowed down as the race proceeded and crossed the finish line in 51:44.82, PR and first place in my age group like I had quietly hoped and prayed. I had never cared for my time as long as I finished in long-distance events, but taking home this title encouraged me to consider focusing on enhancing time as well as distance. I attribute my swift increase in speed to mostly dedication, diligence, and experience, but I also want to give credit to and thank Division I all-American runner Alice Wright out of the University of New Mexico. On June 11, 2016, while eating at Runza, I watched her teammate Courtney Frerichs, now an Olympian, capture an NCAA title in 3,000-meter steeplechase in record-breaking fashion. I then felt compelled to look up some runners on the same roster, and Alice in particular stood out. I saw photos of her intense second-place finish in the 10K at the NCAA’s in June and examined that specific race multiple times. Her expression of giving absolutely all she had left towards the finish line motivated me to push faster and harder, as I thought, after each run, I too should be feeling like she did in the final sprint to introduce an upgrade of me. I constantly reminded myself of this and observed my setting PR’s day after day, including at the Run Country Style. What a difference a simple mentality adjustment makes.